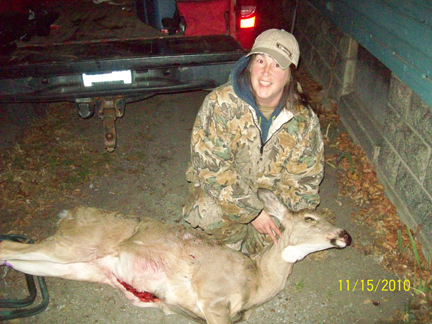 Me with my first deer. 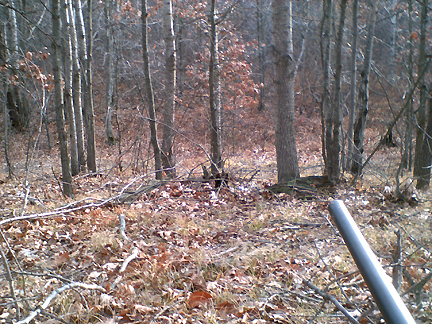 Several years ago I started going out, only during Michigan’s 16-day firearm season. I don’t have the dedication for the lengthy bow seasons. I bought and registered a .270, no thanks to the nosy federal government, and sighted it in at the underground tunnels up the road at Duncan’s. At my house, hunting starts very early, so we’re out in the stands well before first light. Shooting is allowed half an hour before sunrise and half an hour after sunset, but you quickly learn the difference between light and shooting light. Still, someone always seems to jump the gun. Once we’ve tromped out and settled in, the watching and waiting begins. This is the test, because two hours of sitting very still and quiet in the cold gets tedious when there’s not much to watch. Squirrels and birds provide welcome breaks, but sometimes even they are absent. This is how it was Monday, opening day. Someone shot too early. Once there was real light, there was lots of shooting. I’ve been out on three opening days now and I hunt up in a tree stand, so now instead of being frightened — it doesn’t help that I cant tell what directions sounds are coming from — I’m annoyed that other people see deer and I don’t. I pulled out my camera and snapped a few photos. Sun peeks through trees. Stand of trees ahead of me. Different stand of trees to the side. All to be labeled, The Land of No Deer. Actually, there were deer here shortly after. At 8:30 a.m., I saw a doe, then realized there were two, and all was forgiven as I chanted, “Holy cow, holy cow, holy cow.” A rush of happiness filled me. At least I was seeing something. It got better. They walked into the thicket in front of me, but broadside, so I might have a shot if they stepped into a clear enough opening. I was grateful to be getting practice following an animal through a scope. Finally, I had a shot at the lead doe. I could hardly believe the opportunity was here, but I fired. She bolted forward then disappeared. There were a few seconds of crashing, then silence. Well, damn. I was puzzled. Had I missed? How had I missed? And was I positive that was the lead doe that took off, or was it the second one? I froze and watched. Five minutes later, the second doe stood up from her hiding spot and headed out of the thicket the same way she had come in. At first I thought she would leave the area the way she had come in, but then she turned around and headed back into the thicket. Sometime in here I reloaded. And eventually I had another shot, 15 minutes and about 10 yards in front of the first. She moved forward. I scanned for any sign of a wound, seeing none, not knowing yet that I might not. She kept moving forward, then looped out of the thicket and in front of me, crossing the slim open space to follow a fallen tree to my right, then walked slowly straight behind me, looking about sniffing occasionally, not staggering or halting. Two misses? I was ticked at myself. How was this possible? I reloaded and waited. No more deer appeared. 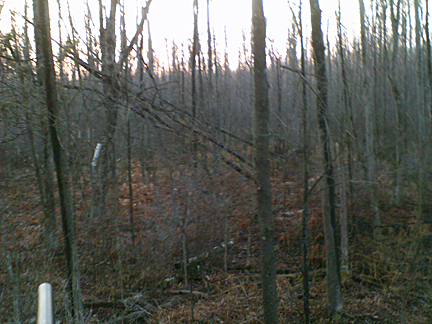 After an hour and a half, I climbed down out of my stand, walked a bit toward where the first deer disappeared, then decided to wait because I didn’t know the area well and had relied on my husband’s scouting. He came in after 11, having heard my shots, and I relayed the morning’s events, pointing as I spoke. There was no blood trail, and I knew only where she had disappeared, not where she had gone. So he started at the edge of the swamp and I started back up into my stand to verify locations, and he found her before I was all the way up the ladder. She crashed into the thickest mess possible and had to be dragged out over numerous logs. We stopped at the first thing resembling a clear spot so we could leave 40 pounds of guts for the coyotes, then pulled her farther out to a spot open enough to bring our wheeled cart into. While my husband and brother-in-law pulled her to the ridge for the hike back to the truck, I walked the ridge just in case I had gone two for two and could spot that other doe. She had seemed pretty healthy, though, and I saw no sign of her anywhere. Hunting is a long day the way we do it. With the doe stashed in the back of the truck and lunch eaten, we discussed where to head out for round two. I didn’t want to go as far back as I had in the morning, so I took up a ground spot a short walk from the truck. There was a runway in front of me and a small valley to the left. I spent the next three hours with only rustling leaves for company. There were no deer here. At the end of the day, there was more storytelling. I had the only shots of the day, although I still didn’t know how I had missed the second time and had to write it off to excitement and maybe pulling up. I am grateful I didn’t wound the second doe, and that the first one was a double lung shot and died within seconds. When I posted a photo for friends, a round of congratulations came in, and a question: Are you going back out? Well, yes. We have more tags to fill, and more scouted land we can hunt if this area turns cold. But tonight, the butchering has begun, and we have a few nights of cutting, trimming and wrapping ahead. I won’t be ready to think about heading back out until this one is in the freezer.